Can RTLS be Used to Ensure Patient Safety and Quality Care? 1. Hand hygiene compliance. Almost every hospital has initiated some type of protocol to ensure that physicians and clinicians are washing hands properly prior to interacting with patients. In order to measure the compliance levels, hospitals have traditionally implemented self-reporting systems or “secret shoppers” to report on fellow staff members. These manual reporting methods are subjective and inaccurate. Instead, hospitals could utilize RTLS applications available to monitor real interactions between patients and hand washing dispensers for automatic reporting that are accurate and reliable. 2. Nurse Rounding. Studies show that a systematic nurse rounding program reduces patient falls, reduces call lights and increases patient satisfaction. Subsequently, hospitals have spent millions on consulting to help implement rounding initiatives. 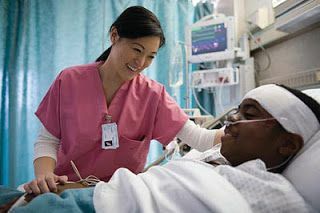 RTLS technology that can deliver room/bed-level accuracy may be used to monitor that nurses are following rounding protocols and actually proactively alert nurses when time is approaching to round on a particular patient. 3. Dirty mobile medical equipment surveillance. RTLS systems can be configured to monitor the location of mobile medical equipment such as infusion pumps in near real-time at room level. This visibility allows business logic to determine if medical equipment has moved directly from one patient room to another without passing through a designated cleaning area first. This situation could then trigger an alarm in the form of an email or text message and also cause the asset tag on the pump to flash an LED light and/or emit an audible alarm. 4. Par levels. Quick access to mobile medical equipment is a cornerstone of any hospital patient safety program. RTLS technology that reliably delivers room/bed-level accuracy allows hospitals to monitor par levels of clean equipment of all types ensuring that clean and ready equipment is ready and close by when needed by a patient. 5. Equipment readiness: All mobile medical equipment is on a preventative maintenance schedule to ensure it is safe for patient use. What happens when a hospital’s clinical engineering department cannot easily locate equipment that needs regular maintenance or, even worse, is subject to a manufacturer recalls? RTLS asset tracking applications provides technicians with increased visibility to quickly and easily locate medical equipment to ensure it is always in safe working order for patients.